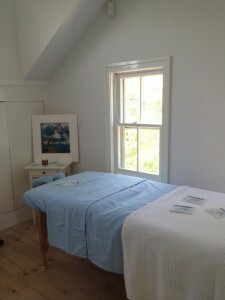 A new spa has opened its blue and white doors in Sag Harbor. The Rejuvenation Spa has the affordable price of $79 for an hour massage (Swedish, deep tissue, reflexology, shiatsu, pre-natal, sport, jet-lag, Tui-Na, and aromatherapy.) Book me early and often and for sure tell me what Tui-Na is! Owner Therese Lindstrom and husband Bill Kamaras wanted a boutique spa that focused on healing to serve the local community with very affordable pricing, about half of the price of a massage at most Hamptons top spas. Therese Lindstrom reports they already have a loyal following from farmers to ladies who lunch. For spontaneous spa-ers they also accept walk-ins from 9am to 9pm. Keep an eye out for acupuncture treatments Friday and Saturday and facials with a new line of ayurvedic products. Rejuvenation Spa will also arrange for therapists to come to your home or better yet yacht. Located behind Main Street near Yoga Shanti, they luckily have lots of parking so no spa stressing. This Sunday July 1st visit their open house is from 11am to 5pm with summer refreshment in the garden, mini massages and art by Rob Lang.